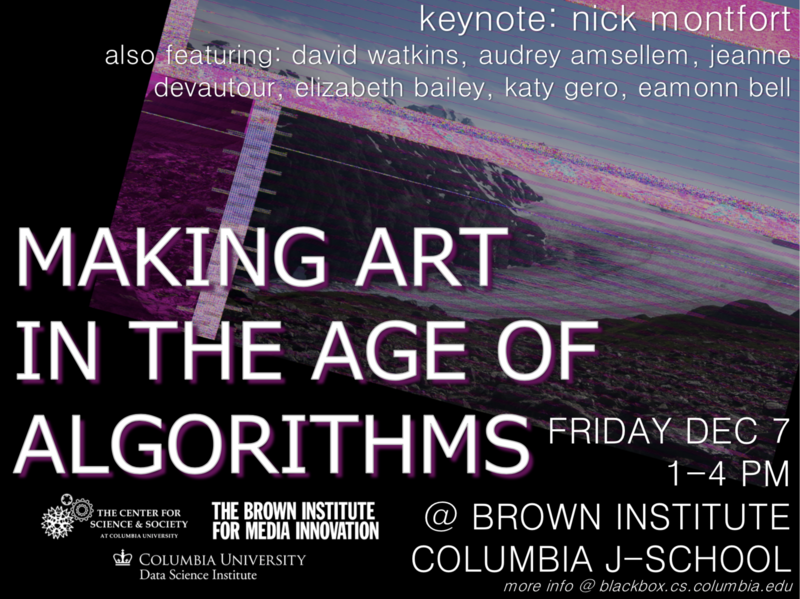 The Arts & Algorithms reading group, with support from the Brown Institute for Media Innovation, the Center for Science and Society, and the Data, Media and Society Center, invites you to Making Art in the Age of Algorithms on December 7, 2018. Nick Montfort will deliver the keynote address at 1pm. Nick is a Professor of Digital Media Studies at MIT, whose work includes algorithmically composed poetry. Arts and Algorithms members David Watkins, Audrey Amsellem, Jeanne Devautor, Elizabeth Bailey, Katy Gero, and Eamonn Bell will report results and offer reflections from 2-4pm. The event will conclude with a catered reception from 4-5pm. Winning art from the DSI Data Art Contest will be displayed. Arts and Algorithms is a reading group composed of undergraduate and graduate students at Columbia which has convened in order to address computers’ becoming increasingly capable of generating art. This symposium will discuss the results of their five meetings throughout fall 2018 and will incorporate the diverse perspectives of the interdisciplinary group. In their first meeting, Arts and Algorithms discussed the meaning of “algorithm” in different fields and time periods, and considered the historical development of algorithmic art alongside that meaning. In their second gathering, the group debated the methodology for gathering and determining quality ingest inputs from which algorithms produce art. The third meeting explored the implications of growing artificial speech technology on art and authorship, while the following meetup addressed early attempts of pre-computer algorithmic art and their learnings. And in the final meeting at the end of November 2018, Art and Algorithms plans to discuss algorithms as artistic processes and their effect on the interpretation of algorithmic art. A detailed report from the reading group can be found at blackbox.cs.columbia.edu.